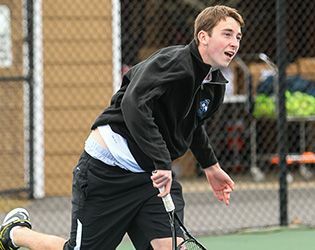 Leading this season's varsity team is four-year letter winner Billy Conlan '16 returning to first singles, a position he played in his junior year as well. After serious training in the off-season, experienced senior players George Harris and Marc Orazietti return to take on second and third singles, respectively. At first doubles, the team will look to the senior-freshman duo of Mike Urowsky '16 and Seth Gelwarg '19. Contributing at second doubles will be Nick Ross '16 and Will Orazietti '18. Rounding out the varsity roster are Brian Qusipe '16 and Will Henderlong '19; Henderlong will split his time between the JV and varsity teams. The JV lineup has worked hard during pre-season and is ready for competition, according to Coach Diane Becker. Leading the effort will be Henderlong at first singles along with Jake Udoff '17, Connor Kirk '18 and Dara Nourbakhsh '19. The team will look for added contributions from juniors Isaac Ling, Ken Zhang '17 and Zhongnan Zhang '17. Sophomore Alan Chen and freshmen Jason Berg, Jack Feldman and Carter will round out the Squad. Tennis is off to a great start, having won four of its first five matchups.